Go-away birds – they sound like something from a children’s fantasy novel, akin perhaps to the Never bird in J.M. Barrie’s classic Peter Pan. And yet they are indisputably – and very audibly – real. Ask any native African hunter attempting to sneak up on his intended animal victim when one or more of these birds is perched close by. 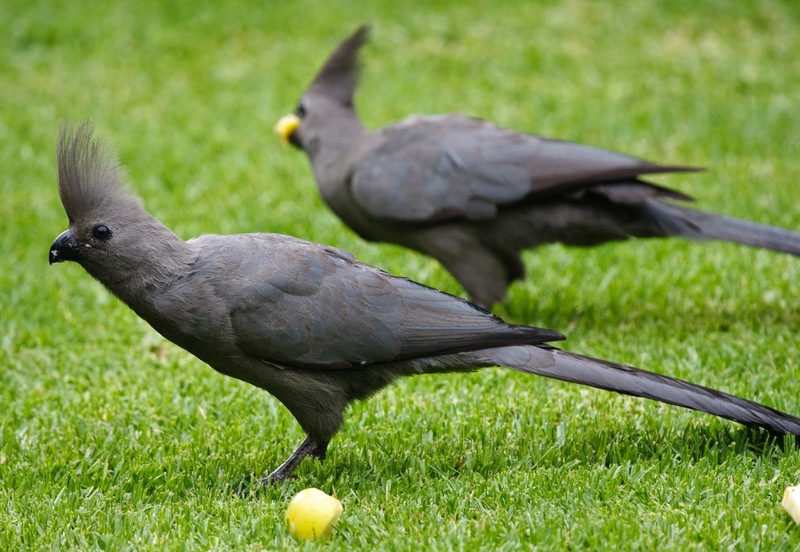 They earn their onomatopoeic name from the sound of their extremely loud, oft-repeated cry, which does sound rather like “g-away!” – check out this YouTube video hereof some grey go-away birds in fine voice, and listen for yourself. Acting very much as self-appointed wildlife sentinels, go-away birds perch high up in tree tops, well out of danger themselves, and then proceed via their raucous alarm cries to warn any unsuspecting antelope or any other prey animal in the vicinity of approaching threats, such as human hunters, lions, cheetahs, and other predators. As a result, both prey and predator do indeed go away – the grateful prey to live another day, the seriously aggrieved predators to glare with impotent rage at their feathered nemeses. But what are go-away birds, zoologically speaking? 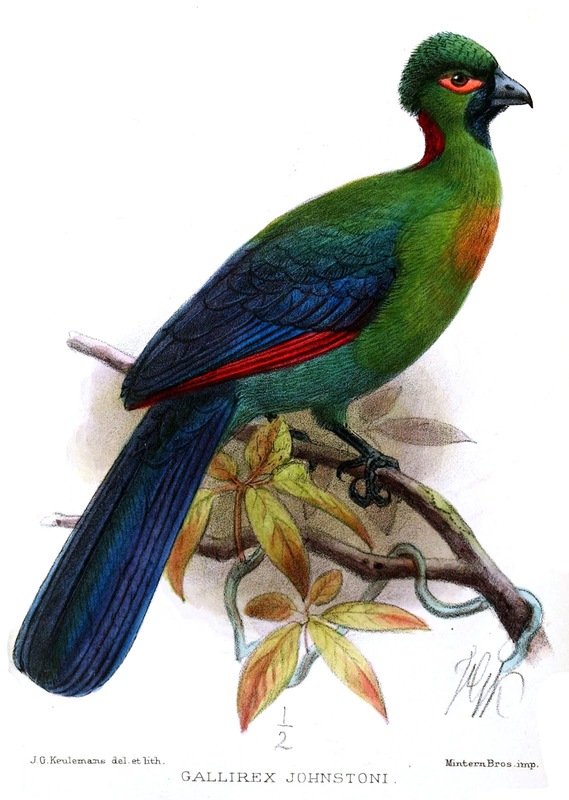 In fact, they are unusually plain-plumaged relatives of the typically gaudy touracos (and less gaudy plantain-eaters). 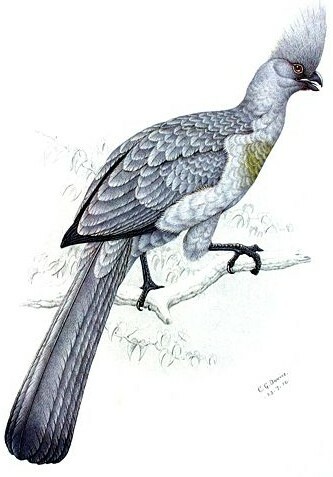 Touracos are famous for their controversial classification – sometimes allied with the cuckoos, sometimes accorded their very own taxonomic order, Musophagiformes. And they are equally celebrated for producing not one but two porphyrin-derived pigments found nowhere else in the animal kingdom – turacin and turacoverdin. 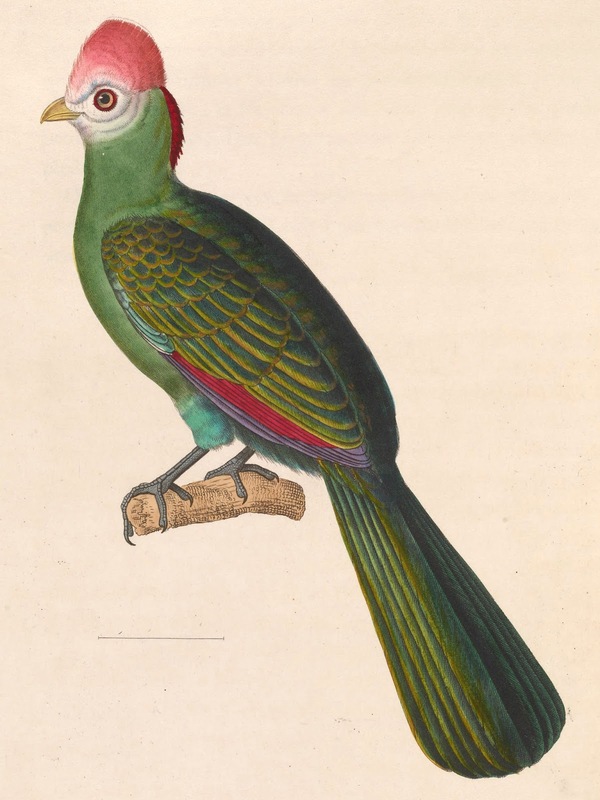 Turacin is the bright crimson pigment commonly seen edging their wings (in all other birds, red colouration is due to the presence of carotenoids); and as its name indicates, turacoverdin is a green pigment that is liberally exhibited in touraco plumage (but in all other birds, green colouration is due to a combination of yellow carotenoids and the scattering of blue light caused by the prismatic qualities of their feathers’ surface structure). 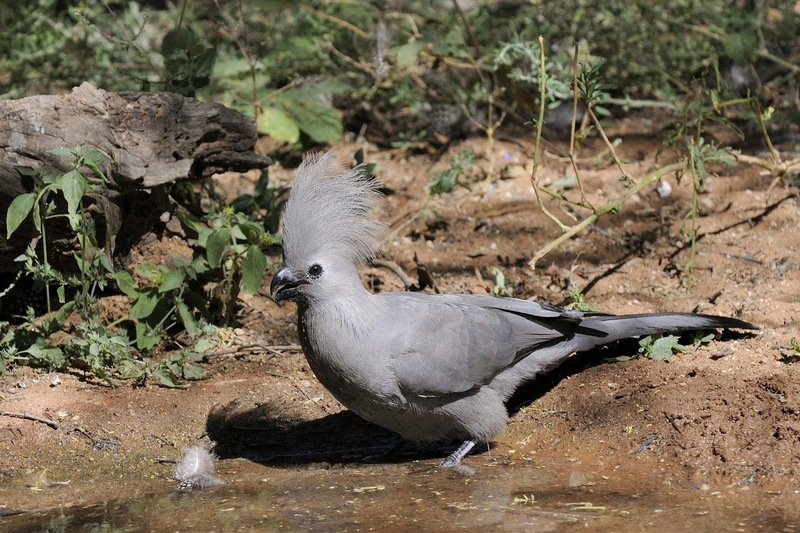 In stark contrast, go-away bird are garbed only in the most sombre, nondescript greys and whites, but possess showy crests and long tails, and average 20 inches or so in total length. Like typical touracos, they are endemic to tropical Africa, gregarious, non-migratory, and live principally upon fruit and flowers,. However, they inhabit open or less forested country, whereas other touracos tend to be predominantly forest dwellers. Three species are recognised. 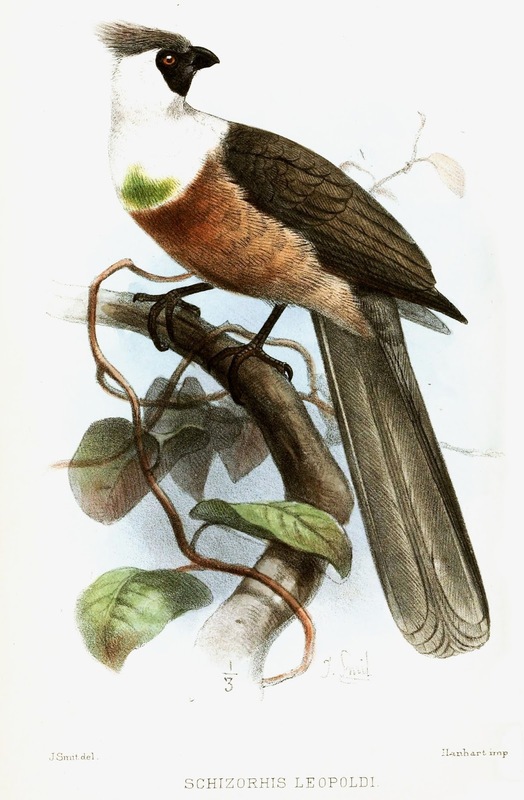 The most attractive member of this trio is the white-bellied go-away bird Corythaixoides leucogaster. 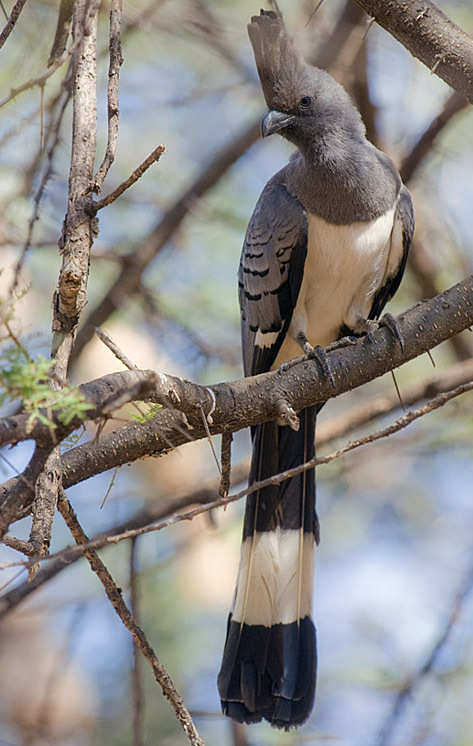 Very widely distributed in East Africa, it boasts a lengthy tail handsomely barred in black and white, and bright white underparts too. 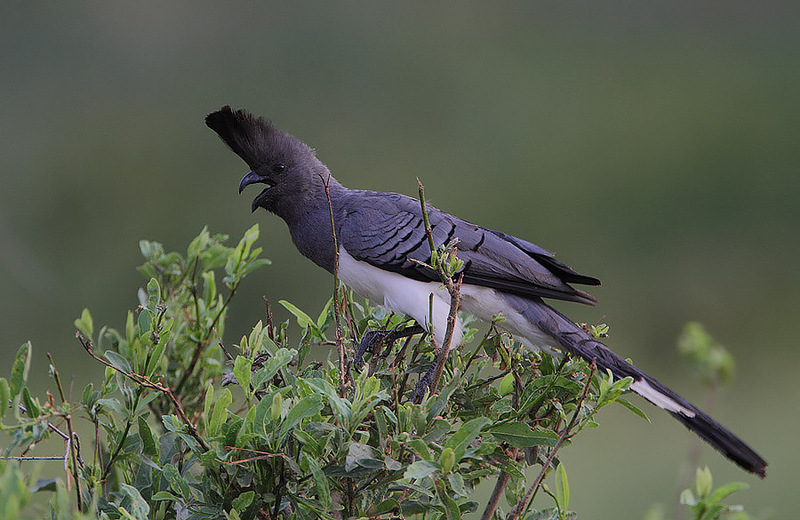 Less dramatic is the aptly-named grey go-away bird C. concolor. Native to much of southern and southeastern Africa (and often visiting suburban gardens and parks), it is indeed predominantly ashen in colour. 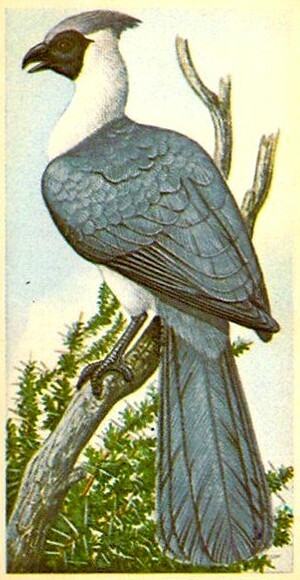 So too is the bare-faced or masked go-away bird C. personatus, but as its name suggests, its facial skin is bereft of feathers and is black in colour, yielding a mask-like appearance that contrasts sharply with its grey crest and the white plumes borne upon the remainder of its face and neck. 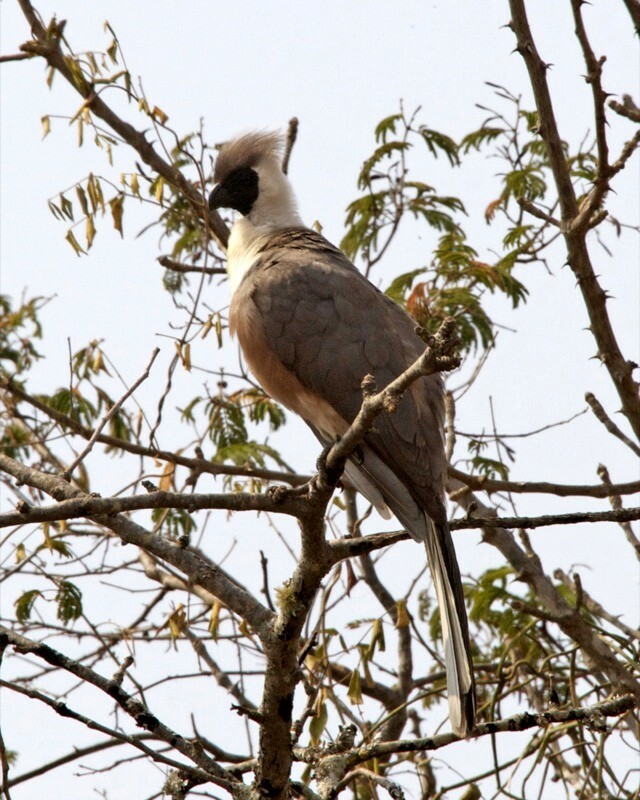 This species has two discrete populations – one covering much of Tanzania, Rwanda, and Burundi as well as stretching into the peripheries of Kenya, Uganda, Zambia, Malawi, and the Democratic Congo, but the other confined entirely to Ethiopia. Happily, none of these three go-away bird species is endangered – much to the chagrin, no doubt, of the hunters all-too-frequently frustrated by their noisy scare-mongering! Click herefor an informative YouTube video featuring a hand-reared white-bellied go-away bird named Mr McBouncyPants at Houston Zoo.